Toronto, Ontario--(Newsfile Corp. - October 30, 2018) - Cordoba Minerals Corp. (TSXV: CDB) (OTCQX: CDBMF) ("Cordoba" or the "Company") today provides an update on recent exploration activities at its Alacran Deposit, located within the 100%-owned San Matias Copper-Gold Project in Colombia. A detailed investigation into the source of Alacran mineralization has led to the identification of a potential porphyry copper-gold source located immediately west of the Alacran Deposit. Drill targets are being finalized ahead of a planned 1,500 metre diamond drill program. 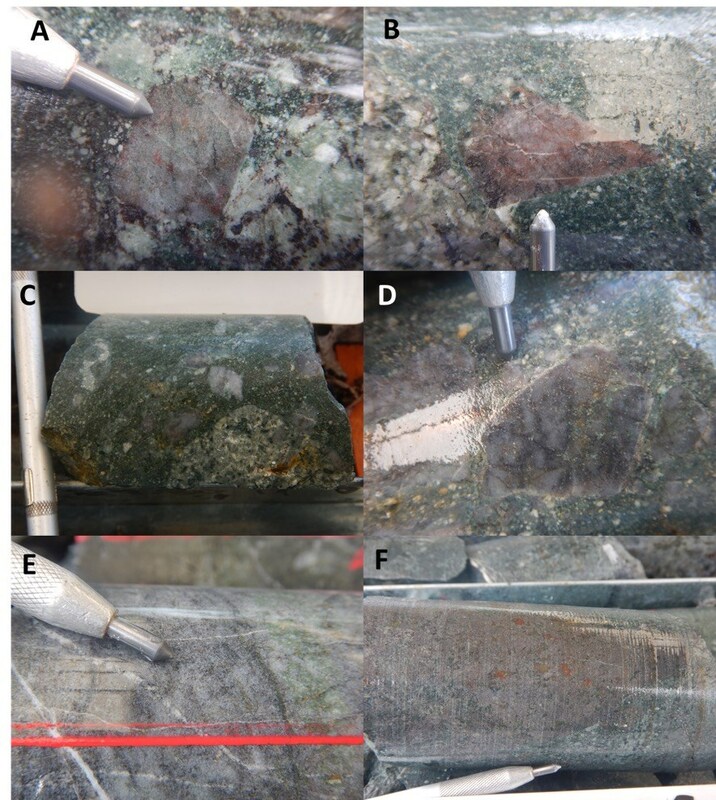 Two distinct styles of mineralization have been identified at Alacran: 1. Replacement (or manto) copper-gold mineralization accounting for the bulk of the Alacran Deposit's Mineral Resources (Indicated: 36.1 million tonnes grading 0.57% copper and 0.26 g/t gold - Inferred: 31.8 million tonnes grading 0.52% copper and 0.24 g/t gold - refer to Cordoba's February 26, 2018 news release); and 2. Carbonate-base metal ("CBM") feeder zones. New evidence from surface mapping and drill hole re-logging suggests that both mineralization types are truncated to the west by late-mineral intrusive breccias. Two distinct types of intrusive breccia have been identified: andesitic and dacitic composition. Both are interpreted to have been emplaced along the same structures that earlier introduced the Alacran mineralizing fluids. While both breccia types contain rock fragments with replacement and CBM styles of mineralization, the dacitic breccia also contains clasts of porphyry-style mineralization with potassic alteration, which may be an indication of a nearby source of porphyry copper-gold mineralization. "We are very pleased by the considerable progress being made at our Alacran Deposit," commented Mario Stifano, President and CEO of Cordoba Minerals. 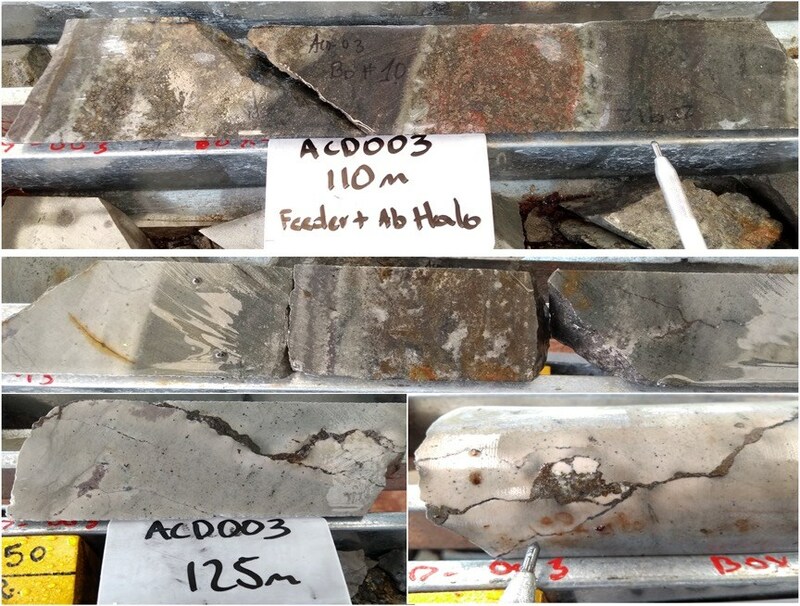 "Through new surface mapping and by re-studying historical diamond drill core, our geological team has identified clasts of porphyry-style mineralization contained within intrusive breccias. We are in the process of finalizing drill targets and expect to commence diamond drilling in the coming weeks." 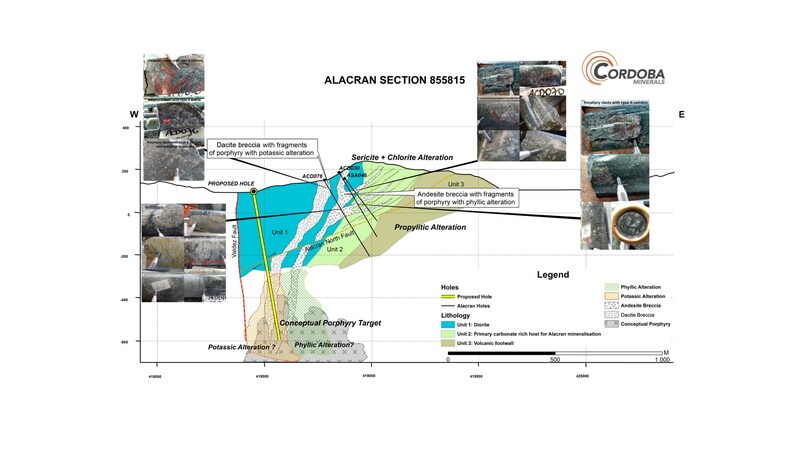 Figure 1: Schematic image showing conceptual porphyry copper-gold target at Alacran. Previously, the focus of exploration at Alacran was to identify massive magnetite and sulphide mantos that replace the Unit 2 carbonate-rich mudstone. This style of mineralization extends over approximately 900 metres from South to Central Alacran and can have a true thickness of up to 40 metres (refer to Figure 2 below). In the north of the Deposit, the manto mineralization transitions to CBM feeder-style mineralization. Figure 2: Alacran manto with massive magnetite and sulphides. The CBM feeder zones consist of carbonate, sericite and albite containing pyrite, chalcopyrite and sphalerite. Hydrothermal fluids are interpreted to have moved along the bedding of the volcano-sedimentary host rocks by exploiting fractures and porosity. Figure 3: Feeder mineralization hosted in fine tuff and siltstone. During recent "boots on the ground" fieldwork, Cordoba's geologists noted that current artisanal mining located near the town of Alacran had exposed a body of intrusive breccia. 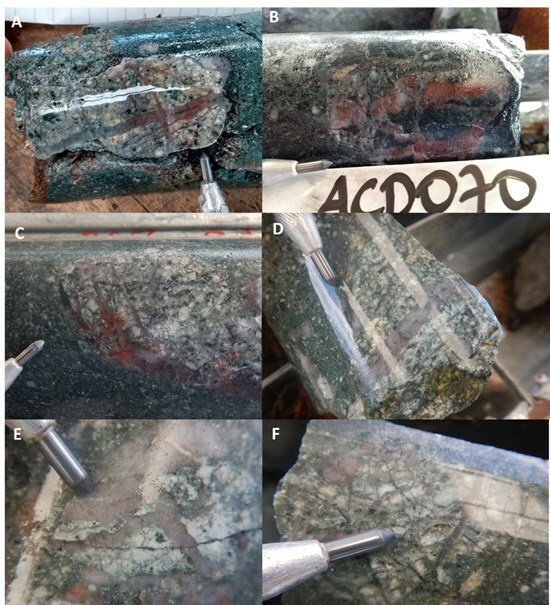 Through subsequent mapping and drill core re-logging, Cordoba's geologists have been able to identify two distinct types of breccia, each containing clasts with porphyry-style alteration and mineralization. The andesitic breccia has a porphyritic andesite matrix altered to sericite and albite. It contains clasts of fine, equigranular to porphyritic diorite showing phyllic alteration. Mineralized clasts are principally manto-style massive sulphide, but some zones also contain CBM fragments. The dacitic breccia is particularly interesting because it has a porphyritic dacite matrix and contains angular clasts of hornblende porphyry with both potassic and phyllic alteration. Importantly, the clasts with potassic alteration also contain porphyry-style A veins. Previously identified internal metal zoning patterns within the Alacran Deposit (refer to Cordoba's August 8, 2018 news release), which show increased gold, copper, silver and zinc values in the Central and Northern portion of the Deposit, are now believed to be spatially related to the breccias. Figure 6: Breccias related to mineralized zones in the Alacran Deposit. Altered porphyry clasts are present in both the dacitic and andesitic breccias; however, only in the dacitic breccia are clasts with potassic alteration observed. These fragments have disseminated magnetite and feature sinuous Type A veinlets of saccharoidal quartz containing magnetite and chalcopyrite. Figure 7: Porphyritic fragments with Type A veinlets. Silicified country rock fragments containing quartz veins and disseminated magnetite, chalcopyrite, pyrite and molybdenite have also been identified. Quartz clasts in the breccia are also thought to be "vein clasts" that consist entirely of mineralized vein material. Figure 8: "Vein clasts" as well as silicified country rock fragments containing chalcopyrite, pyrite, disseminated magnetite and quartz veining. Unidirectional Solidification Textures ("USTs") contained within the porphyry clasts are often seen in porphyry deposits at the top or "apical" portions of the intrusive stock in association with potassic alteration and Type A veining. Figure 9: Unidirectional Solidification Textures. Given the potential impact of these recent observations, the Company has decided to delay the Alacran Preliminary Economic Assessment until the area of interest has been explored with drilling. The scientific and technical information in this release has been reviewed and verified by Dale A. Sketchley, M.Sc., P.Geo., a Qualified Person for the purpose of National Instrument 43-101. Mr. Sketchley is a consultant to Cordoba Minerals and is considered independent under National Instrument 43-101. Mr. Sketchley is a geologist with over 40 years in the mineral exploration, mining and consulting industry. He is a Member of the Association of Professional Engineers and Geoscientists of British Columbia (APEGBC) and the Canadian Institute of Mining and Metallurgy (CIMM). An independent, National Instrument 43-101 compliant, technical report for the Alacran Deposit, dated April 10, 2018 and prepared by Amec Foster Wheeler Americas Limited, is available under the Cordoba's SEDAR profile at www.sedar.com and on Cordoba's website at www.cordobaminerals.com. Eugene Schmidt was instrumental in identifying new prospective targets at Alacran and in the greater San Matias District. Having completed this objective, he will transition back to a consultant role to advise the Company during exploration and drilling at Alacran as well as at Perseverance in Arizona, USA. Although no longer acting as Vice President, Exploration, he will continue to generate new ideas and potential projects for Cordoba. Cordoba Minerals Corp. is a Toronto-based mineral exploration company focused on the exploration and acquisition of copper and gold projects. Cordoba is currently focused on its 100%-owned San Matias Copper-Gold Project, which includes the advanced-stage Alacran Deposit, located in the Department of Cordoba, Colombia. Cordoba has also entered into a joint venture and earn-in agreement to explore the Perseverance coppery porphyry project located in Arizona, USA. For further information, please visit www.cordobaminerals.com. This news release includes "forward-looking statements" and "forward-looking information" within the meaning of Canadian securities legislation. All statements included in this news release, other than statements of historical fact, are forward-looking statements including, without limitation, (i) that exploration has identified a potential source of mineralization for the Alacran Deposit; (ii) that an area located to the west of Alacran could represent a potential copper porphyry target; and (iii) that exploration activities may lead to new or large-scale discovery at Alacran. Forward-looking statements include predictions, projections and forecasts and are often, but not always, identified by the use of words such as "anticipate", "believe", "plan", "estimate", "expect", "potential", "target", "budget" and "intend" and statements that an event or result "may", "will", "should", "could" or "might" occur or be achieved and other similar expressions and includes the negatives thereof. Forward-looking statements are based on a number of assumptions and estimates that, while considered reasonable by management based on the business and markets in which Cordoba operates, are inherently subject to significant operational, economic, and competitive uncertainties, risks and contingencies. There can be no assurance that such statements will prove to be accurate and actual results, and future events could differ materially from those anticipated in such statements. Important factors that could cause actual results to differ materially from the Company's expectations include actual exploration results, interpretation of metallurgical characteristics of the mineralization, changes in project parameters as plans continue to be refined, future commodity prices, availability of capital and financing on acceptable terms, general economic, market or business conditions, uninsured risks, regulatory changes, delays or inability to receive required approvals, and other exploration or other risks detailed herein and from time to time in the filings made by the Company with securities regulators, including those described under the heading "Risks and Uncertainties" in the Company's most recently filed MD&A. The Company does not undertake to update or revise any forward-looking statements, except in accordance with applicable law.